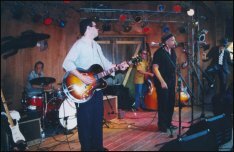 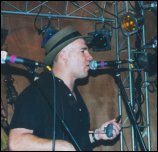 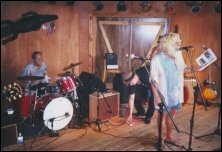 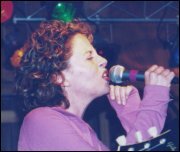 The photos below are from the concert with Levon Helm & the Barn Burners at the Bubba Mac Shack in Somers Point, New Jersey, July 1, 2000. 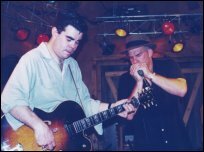 One picture is of Bubba himself introducing the band. 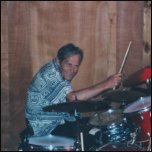 He is telling the story of The Band's residence in the summer of 1965 at Tony Mart's club, which used to be just down the street. 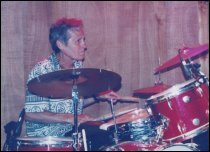 It was at Tony Mart's that Levon received the phone call from Bob Dylan asking them to become his backup band. 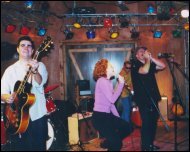 The Barn Burners lineup is: Pat O'Shea, lead guitar; Chris O'Leary, vocals & harp, Frank Ingrao, bass; Amy Helm, vocals; and of course, Levon Helm, drums.